I traveled to Columbus last weekend to pay my family a visit. While it was nice to give them a little surprise (I didn't tell them about my plans), ended up coming down with quite a cough thanks to my reliably awful allergies. No manner of OTC medication seems to help the cough, but I find plenty of solace in a good cup of tea and a hot water bottle or heating pad. I have a little floral bottle that is super cute, but gets cold fairly fast without a good cover. I love to use it on my feet, under a warm blanket while I knit on the couch. So comforting! No matter how warm it is, I always seem to have freezing feet! 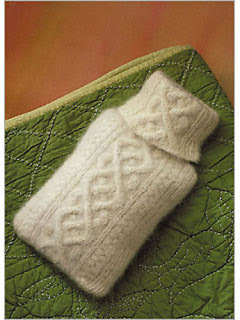 So how about the Aran Felted cover from Ann Budd for Interweave? Felted fabric is SO warm! I love the classic sweater look... Even the top is reminiscent of a turtleneck! Elly Fales has a cute Hot-Water Bottle Cover that includes a little pocket... Perhaps for a small sachet of lavender, or a scent-infused cloth pad? 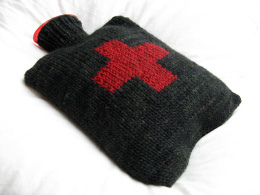 Great for colds, and would look so cute in a little get-well-soon kit. Elly has a really cute blog, too, if you're looking to add to your collection. Julie Wiesenberger's Hot Water Bottle Cozies design is simultaneously graphic and whimsical. I love this as a masculine (or andro) alternative to the more traditionally feminine bottles. Do you remember Julie? She also designed Liesl and those cute pleated ballet flats I've featured here. Love her! What makes you feel comfy on a bad day? Share it in the comments!